Sis and Sis’ relationship is more than just Sun sign compatibility of Virgo and Aries. No individual is a pure Virgo or Aries but instead is a unique combination of signs and planets. The following interpretation defines the synastry or interplanetary aspects between the planets in Sis’ birth chart and the planets in Sis’ birth chart. There is no evil planet in the combinations. No single combination can make or break the relationship. The list goes from the most harmonious (positive) to the most discordant (negative). Sis’ Venus Trines Sis’ Pluto (+10.69 harmony) – Sis’ sense of sexuality, attraction, or intimacy combines very effortlessly with Sis’ sense of transformation, change, or power and destiny. There is harmony when both enjoy moving forward and growing through the relationship. There are feelings of relief and enlightenment after a relationship challenge. The magnetic attraction between Sis and Sis makes it impossible to separate them permanently. Sis’ Jupiter Trines Sis’ Jupiter (+7.88 harmony) – The individual sense of growth, expansion, or generosity combines very comfortably with the couple. Sis and Sis’ point of view about philosophy, ethics, or religion are in harmony. Both support each other to expand their horizons. The relationship encourages optimism, self-confidence, and humor. Usually, the older person will guide the younger. Sis’ Venus Trines Sis’ Venus (+7.75 harmony) – The individual sense of sexuality, attraction, or intimacy combines very comfortably with the couple. There is harmony in the way each other expresses affection. Social, cultural, and financial interests are the same. Both enjoy the same pleasures in life. Sis and Sis have the desire to help and encourage each other. The relationship is a romantic attraction. Sis’ Jupiter Sextiles Sis’ Saturn (+6.94 harmony) – Sis’ sense of growth, expansion, or generosity combines pleasantly with Sis’ sense of commitment, necessity, or duty. Sis’ practicality stimulates Sis’ expansive ideas. Sis provides vision while Sis creates structure. Both work better as a team to achieve a common goal. This aspect is also favorable in a business partnership. Sis’ Jupiter Trines Sis’ Neptune (+6.22 harmony) – Sis’ sense of growth, expansion, or generosity combines very effortlessly with Sis’ sense of spirituality, imagination, or mystical inclination. Sis’ expansive dreams are in harmony with Sis’ intuitions. Both are spiritually compatible. The relationship encourages idealism and charitable instincts in each other. Sis’ Uranus Sextiles Sis’ Neptune (+6.04 harmony) – Sis’ respect for expression of individuality combines pleasantly with Sis’ mystical, spiritual inclinations. Both help each other to bring their individual ideas to life. The relationship encourages each other to think outside the box. Sis and Sis have a strong intuitive connection. Sis’ Saturn Trines Sis’ Pluto (+4.53 harmony) – Sis’ sense of commitment, necessity, or duty combines very effortlessly with Sis’ sense of transformation, change, or power and destiny. Sis’ steady and patient practicality is in harmony with Sis’ quiet but immense power. Both Sis and Sis are good in planning together big projects and will make good use of each other’s experience. This aspect is good for a business partnership. Sis’ Mercury Sextiles Sis’ Uranus (+4.33 harmony) – Sis’ mentality and powers of perception combine pleasantly with Sis’ sense of independence, freedom, and originality. Both stimulate the intellectual and mental awakening in each other. Sis and Sis bring out each other’s innate genius and encourage its development. The relationship generates tremendous creativity. Communication flows smoothly. Both enjoy the frequent exchange of challenging ideas. Sis’ Mars Sextiles Sis’ Neptune (+4.12 harmony) – Sis’ sexual drive, temper, and powers of self-assertion combine pleasantly with Sis’ sense of spirituality, imagination, or mystical inclination. The initiative of Sis stimulates the sacrificial tendency in Sis. Sis and Sis will support each other to a significant degree, both emotionally and creatively. Sis’ Sun Trines Sis’ Mercury (+2.53 harmony) – Sis’ sense of identity, ego, will, and character combine very easily with Sis’ mentality and powers of perception. The flow of communication between Sis and Sis is in harmony. There is a stimulating conversation in the relationship. Sis understands Sis’ intentions. Sis supports Sis’ intellectual excitement. Sis is able to discuss problems with Sis. Together they can work out a solution. Sis’ Mars Trines Sis’ Pluto (+1.05 harmony) – Sis’ sexual drive, temper, and powers of self-assertion combine very effortlessly with Sis’ sense of transformation, change, or power and destiny. There is an impressive harmony between Sis and Sis. Both can strengthen each other’s willpower to tackle any large-scale projects together. This aspect is perfect for a business partnership. Sis’ Jupiter Conjuncts Sis’ Neptune (+0.68 harmony) – Sis’ sense of growth, expansion, or generosity combines with Sis’ sense of spirituality, imagination, or mystical inclination. Both are spiritually compatible and encourage each other to realize real goals. There is a combined tendency towards extravagance and self-indulgence. Sis’ Sun Trines Sis’ Venus (+0.44 harmony) – Sis’ sense of identity, ego, will, and character combine very effortlessly with Sis’ understanding of sexuality, attraction, or intimacy. There are wealth and material bond between Sis and Sis. Sis’ power of attraction is in harmony with Sis’ confidence and abilities. There is a strong romantic and magnetic attraction with each other. The relationship offers financial security and generosity in sharing everything with one another. Sis’ Moon Sextiles Sis’ Venus (+0.33 harmony) – Sis’ emotional needs combine pleasantly with Sis’ sense of sexuality, attraction, or intimacy. The relationship stimulates deep mutual devotion and affection in each other. Both tend to be liberal on financial matters. Sis and Sis have common interests in many things including social activities. There is a strong attraction for love and marriage between Sis and Sis. Sis’ Neptune Sextiles Sis’ Pluto (+0.14 harmony) – Sis’ mystical or spiritual inclination combines pleasantly with Sis’ sense of transformation, change, or power and destiny. The spiritual urge of Sis stimulates the reforming urge of Sis. Both will support and encourage each other’s spiritual enlightenment. The relationship inspires each other to meet the world with compassion and grace. Sis’ Venus Conjuncts Sis’ Pluto (+0.10 harmony) – Sis’ sense of sexuality, attraction, or intimacy combines with Sis’ sense of transformation, change, or power and destiny. There is an intense sexual attraction in the relationship. Both share a deep emotional tie. Sis may become possessive, jealous, and demand more intimacy than Sis is capable of giving. Times of frustration is followed by enlightenment and release. Sis’ Neptune Conjuncts Sis’ Neptune (neutral) – The individual sense of spirituality, imagination, or mysticism combines with ease within the couple. Both Sis and Sis share the same tastes in art, music, or religion. The relationship encourages positive traits of creativity and dreaminess. It also has the tendency to promote negative characteristics of laziness or indecisiveness in Sis or Sis. Sis’ Uranus Conjuncts Sis’ Pluto (neutral) – Sis’ sense of independence, freedom, and originality may combine or resist with Sis’ sense of transformation, change, or power and destiny. The intensity will depend on other factors of the relationship. This is favorable if Sis and Sis have more aspects in harmony than in discord. Sis’ Pluto Conjuncts Sis’ Pluto (neutral) – The individual sense of transformation, change, or power and destiny combine with ease within the couple. Sis and Sis enjoy the same cultural references. Sis and Sis have a great time talking about the good old days since both came from the same generation. Sis’ Venus Opposes Sis’ Jupiter (-0.35 discord) – Sis’ sense of sexuality, attraction, or intimacy confronts and challenges Sis’ spirit of growth, expansion, or generosity. There is tension on how each other will handle finances. Sis may occasionally accuse Sis of not being entirely open and honest. Sis may accuse Sis of being too open and honest. From time to time this aspect can bestow good luck. Sis’ Venus Conjuncts Sis’ Saturn (-1.54 discord) – Sis’ sense of sexuality, attraction, or intimacy combines with Sis’ sense of commitment, necessity, or duty. Both will show love through practical means and material accomplishment. Sis provides the mental, emotional, and financial stability in the relationship. Sis’ sympathy and affection stimulate Sis’ confidence. Sis can become possessive of Sis. Sis can feel restricted by Sis’ criticism and discipline. Sis’ Jupiter Opposes Sis’ Pluto (-2.39 discord) – Sis’ sense of growth, expansion, or generosity confronts and challenges Sis’ sense of transformation, change, or power and destiny. Personal struggles between Sis and Sis can’t be avoided. There will be conflicting ideas that can lead to misunderstanding or make cooperation difficult. Sis’ Venus Opposes Sis’ Jupiter (-2.93 discord) – Sis’ sense of sexuality, attraction, or intimacy confronts and challenges Sis’ spirit of growth, expansion, or generosity. There is tension on how each other will handle finances. Sis may occasionally accuse Sis of not being entirely open and honest. Sis may accuse Sis of being too open and honest. From time to time this aspect can bestow good luck. Sis’ Jupiter Opposes Sis’ Uranus (-2.97 discord) – Sis’ sense of growth, expansion, or generosity confronts and challenges Sis’ sense of independence, freedom, and originality. There is tension in the radical views and differences in social or religious ideas. One or both will show extravagance and resistance to responsibility. Sis’ Moon Squares Sis’ Uranus (-3.20 discord) – Sis’ emotional needs interact stressfully with Sis’ sense of independence, freedom, and originality. The friction can arouse irritations between Sis and Sis. Sis is eccentric, inconsiderate, and unpredictable. Sis is hypersensitive and moody. Any romantic attraction can lead to an unusual relationship that may not last long unless other aspects stabilize the connection. Sis’ Sun Opposes Sis’ Uranus (-3.58 discord) – Sis’ sense of identity, ego, will, and character confront and challenge Sis’ sense of independence, freedom, and originality. There is tension in the selfish nature of Sis and the independent nature of Sis. Both are out of touch with the need for space in the relationship. The bond that initially attracted Sis and Sis together becomes a confusing tug of war between togetherness and individuality. Sis’ Moon Conjuncts Sis’ Saturn (-4.46 discord) – Sis’ emotional needs combine with Sis’ sense of commitment, necessity, or duty. Whether the fusion will work for good or ill will depend on other aspects. Sis tends to discipline that can adversely affect the feelings of Sis. Sis may feel restricted and resentful of the limitations that Sis imposes in the relationship. This aspect usually forms when there is a wide age gap between Sis and Sis. Sis’ Moon Squares Sis’ Mercury (-5.20 discord) – Sis’ emotional needs interact stressfully with Sis’ mentality and powers of perception. There is friction in the mismatch of tastes and interests. Sis is hypersensitive and tend to misinterpret Sis’ intentions. Sis pays no attention or ignores the sensitive nature of Sis. Arguments and debates are common in the relationship. Sis’ Mercury Opposes Sis’ Uranus (-5.37 discord) – Sis’ mentality and powers of perception confront and challenge Sis’ sense of independence, freedom, and originality. There is tension when both minds meet. Sis may seem unstable and erratic to Sis. Sis may seem elusive and contradictory to Sis. Sis stimulates, excites, and irritates Sis’ mind simultaneously. Sis can’t understand the complex mind of Sis. Understanding and adjustment to each other are difficult to achieve in the relationship. Sis’ Mercury Squares Sis’ Venus (-5.45 discord) – Sis’ mentality and powers of perception interact stressfully with Sis’ sense of sexuality, attraction, or intimacy. There is an exciting exchange of ideas that later on can cause friction in the relationship. There may be occasional small misunderstandings between Sis and Sis. One listening to the other is a hit or miss. Sis tends to disregard the emotional needs of Sis. Sis may find Sis cold and calculative. Sis’ Mars Squares Sis’ Jupiter (-6.25 discord) – Sis’ sexual drive, temper, and powers of self-assertion interact stressfully with Sis’ sense of growth, expansion, or generosity. There is friction in Sis’ instincts and Sis’ ethical point of view. There is a natural tendency to be extravagant in one or both individual. Sis’ Venus Opposes Sis’ Neptune (-8.94 discord) – Sis’ sense of sexuality, attraction, or intimacy confronts and challenges Sis’ sense of spirituality, imagination, or mystical inclination. There may be a one-sided attraction between Sis and Sis. There is likely to be a certain amount of confusion, deception, even evasion in one or both. Unfounded jealousies can cause tension and misinterpretation of each other’s attitudes toward the relationship. Sis’ Mars Squares Sis’ Saturn (-9.71 discord) – Sis’ sexual drive, temper, and powers of self-assertion interact stressfully with Sis’ sense of commitment, necessity, or duty. There is friction in Sis’ constructive ideas and Sis’ enthusiasm. Sis may have unreasonable demands for Sis. This makes Sis impatient, angry, and defiant. The relationship has many problems of adjustment. Sis’ Saturn Opposes Sis’ Neptune (-10.45 discord) – Sis’ sense of commitment, necessity, or duty confronts and challenges Sis’ sense of spirituality, imagination, or mystical inclination. There is tension in Sis’ domineering nature and Sis’ anti-social or evasive behavior. Both might challenge their idea of reality and could end up hurting each other’s self-esteem. Sis’ Mars Squares Sis’ Neptune (-10.67 discord) – Sis’ sexual drive, temper, and powers of self-assertion interact stressfully with Sis’ sense of spirituality, imagination, or mystical inclination. There is friction in Sis’ elusive reaction to Sis’ unexpected behavior. The relationship can cause emotional disturbance and extravagance in one or both. Sis’ Sun Squares Sis’ Moon (-11.99 discord) – Sis’ sense of identity, ego, will, and character interact stressfully with Sis’ emotional needs. There is friction in basic temperaments and personalities. Sis’ domineering personality can overwhelm Sis’ emotional and sensitive nature. Sis can appear moody to Sis’ inconsiderate behavior. Sis’ Mercury Opposes Sis’ Mars (-12.20 discord) – Sis’ mentality and powers of perception confront and challenge Sis’ sexual drive, temper, and powers of self-assertion. There is tension in Sis’ aggressive attitude and Sis’ rational reasoning. Petty quarrels in the relationship will make cooperation challenging to achieve. Sis’ sarcasm could provoke Sis’ temper. Sis’ Saturn Squares Sis’ Uranus (-14.51 discord) – Sis’ sense of commitment, necessity, or duty interacts stressfully with Sis’ sense of independence, freedom, and originality. There is friction in the conservative principles of Sis and the progressive nature of Sis. Sis will restrict Sis’ progress and expression of individuality. Sis will rebel against the traditional and controlling character of Sis. There are 5 mutual receptions in Sis and Sis’ planet combinations. Planets in mutual reception enhance each other. This will add +50 harmony to the total score. The remaining -20.61 discord is due to some minor aspects or planets in parallel. 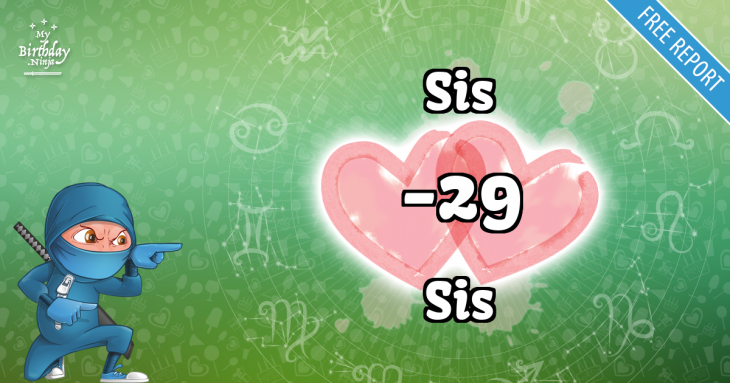 This is only a quick assessment of the relationship compatibility between Sis and Sis. If both place and time of births are known, an in-depth interpretation is available in the Star Lovers Report. Try a free sample with no obligation to buy. Ssshhh! Sis, don’t let Sis know. You are most compatible with a person born on August 2, 1947. You have a whooping birthday love match score of +142 with that person. Check it out and imagine what it feels like to be with your soul mate.